"I think it's important to play the music written in our time. 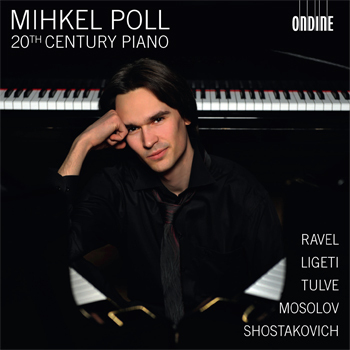 A couple of hundred years ago this was the norm, and it's important not to lose this tradition," says young rising star pianist Mihkel Poll, commenting on the repertoire choice for his debut CD recording. The programme covers one century of piano music, ranging from Maurice Ravel's Gaspard de la nuit (written in 1908) to Estonian composer Helena Tulve's Three Songs for Piano (2008). Mihkel Poll was born 1986 in Tallinn, Estonia, and was trained by Ivari Ilja at the Estonian Academy of Music and Theatre, and more recently by Ronan O'Hora at the Guildhall School of Music and Drama in London. He is the winner of several international piano competitions, including "Rina Sala Gallo" in Italy (2004), First Tallinn Piano Competition in Estonia (2006), and Ferrol Piano Competition in Spain (2006) and has worked with such orchestras as Latvian National Symphony Orchestra and Estonian National Symphony Orchestra. His exceptionally wide-ranging repertoire includes composers from Bach to Ligeti, whose piano concerto he has performed to great acclaim.